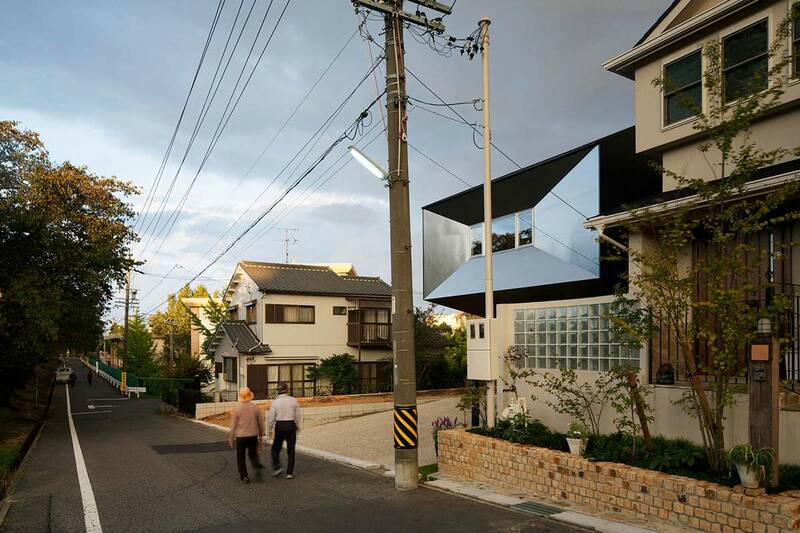 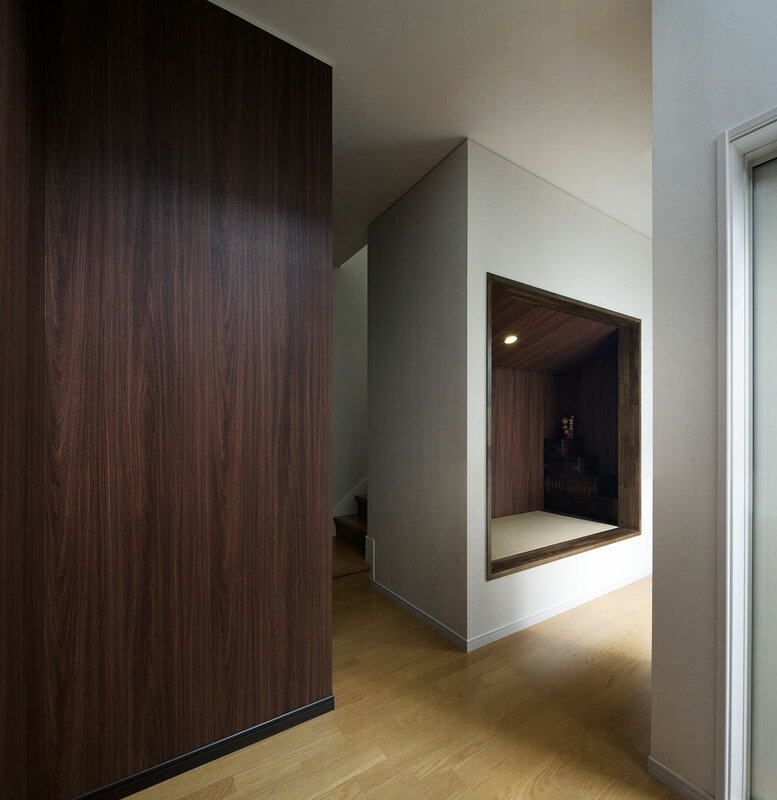 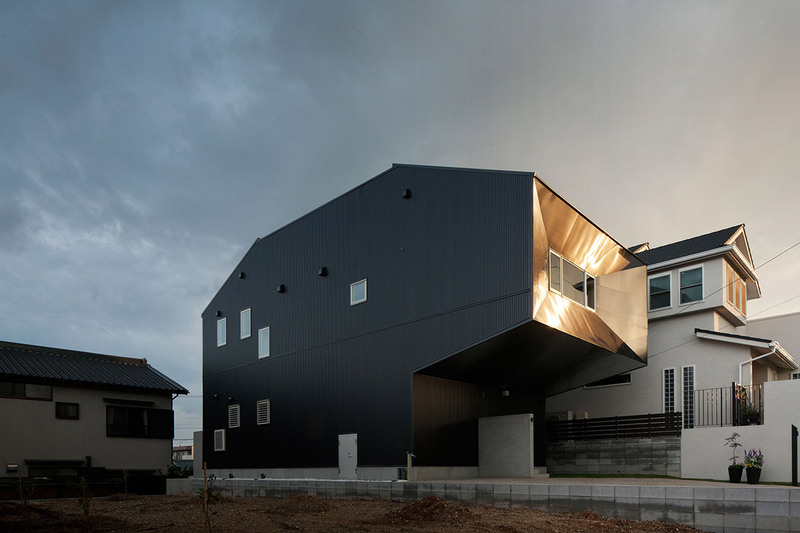 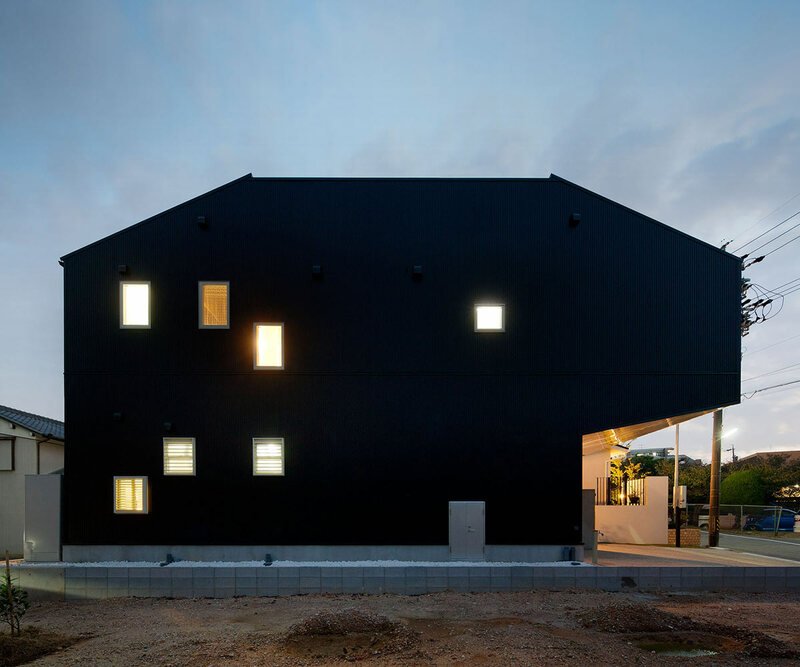 The Hansha Reflection House was completed in 2011 by the Tokyo based architects Studio SKLIM. 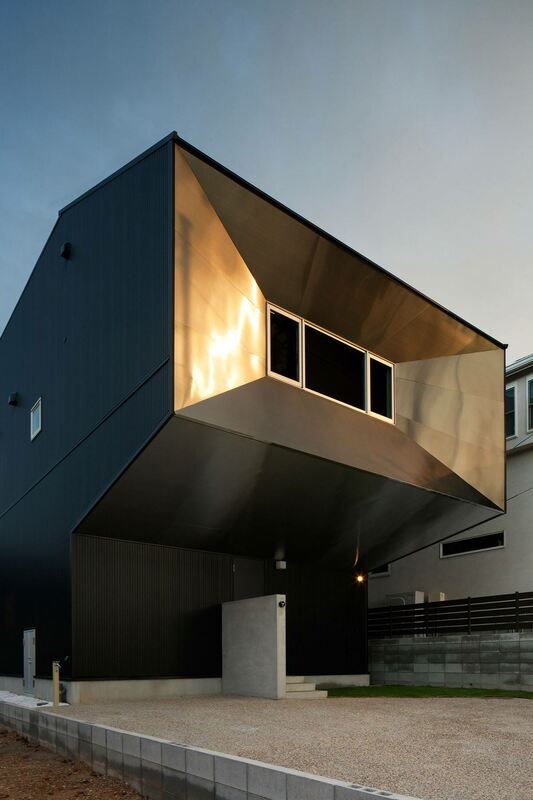 This 1,334 square foot, two story contemporary residence is located in Nagoya, Japan. 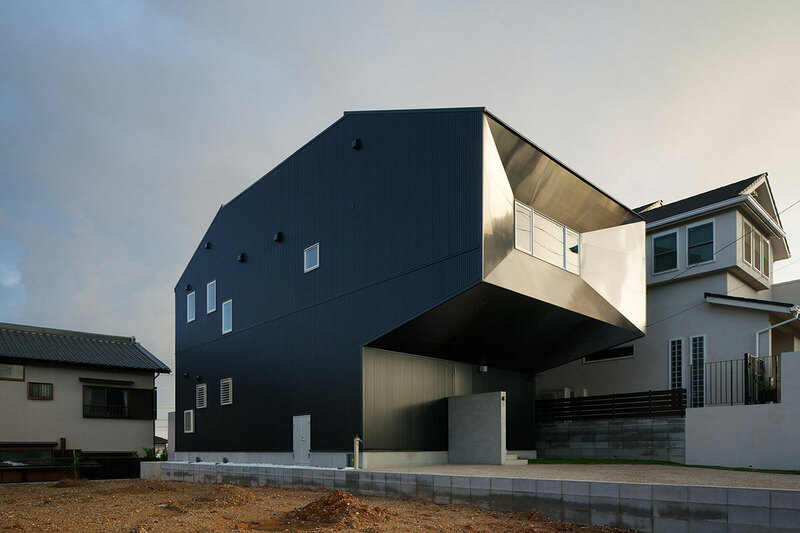 “Hansha Reflection House is a specific residence for a specific site, set to address the ephemeral moments of the surroundings with structural ingenuity and material sublimity. 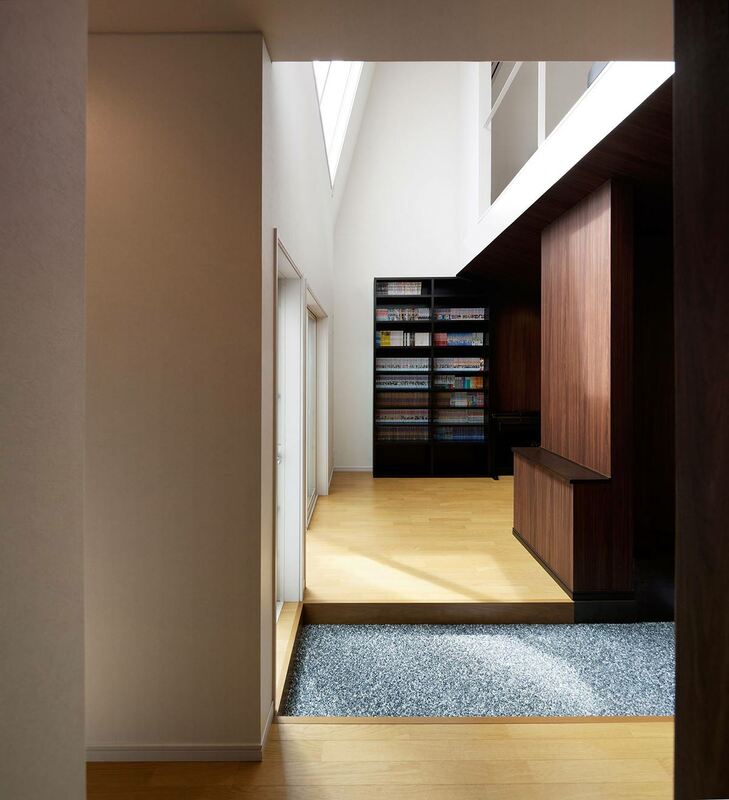 Situated at the entrance of Misakimizube Koen, one of the picturesque parks fronting a lake and flanked by Sakura trees, the house was conceived to be an object with the environment.The programmatic zones of Public, Service and Private spatially organised the house into 3 distinct zones with further punctuation of the main massing with the Landscape element; providing spaces for the courtyard and roof deck. 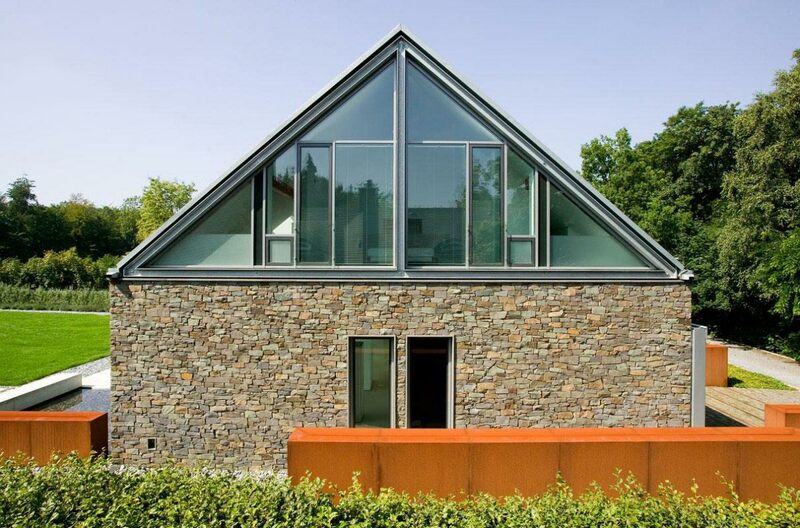 This base form was further chiselled with structure, daylight/ventilation and viewpoint concerns. 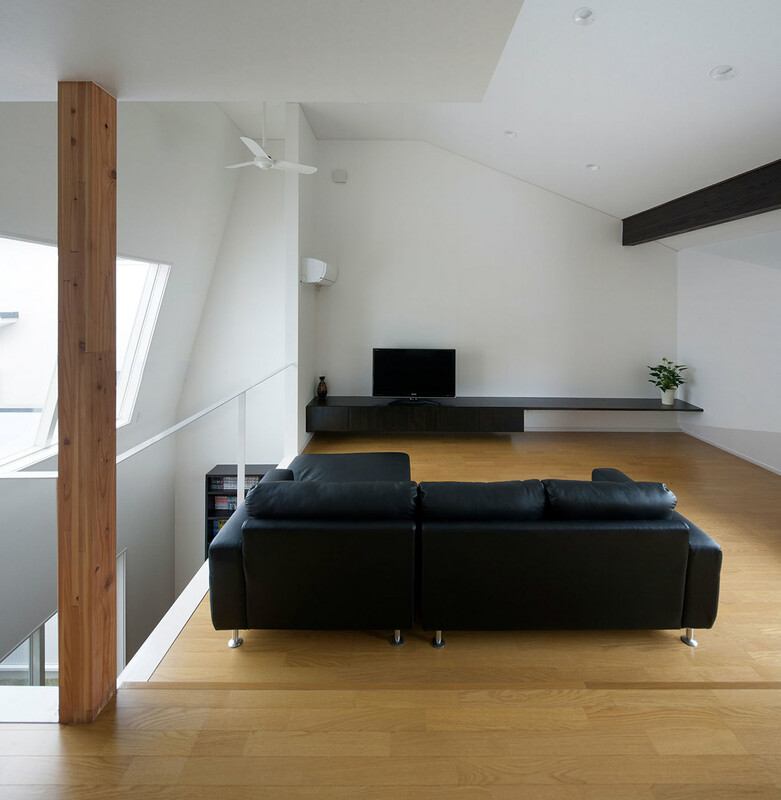 65% of low rise Japanese houses are constructed out of timber, a material that has the strongest weight to strength ratio amongst other building materials like concrete and steel. 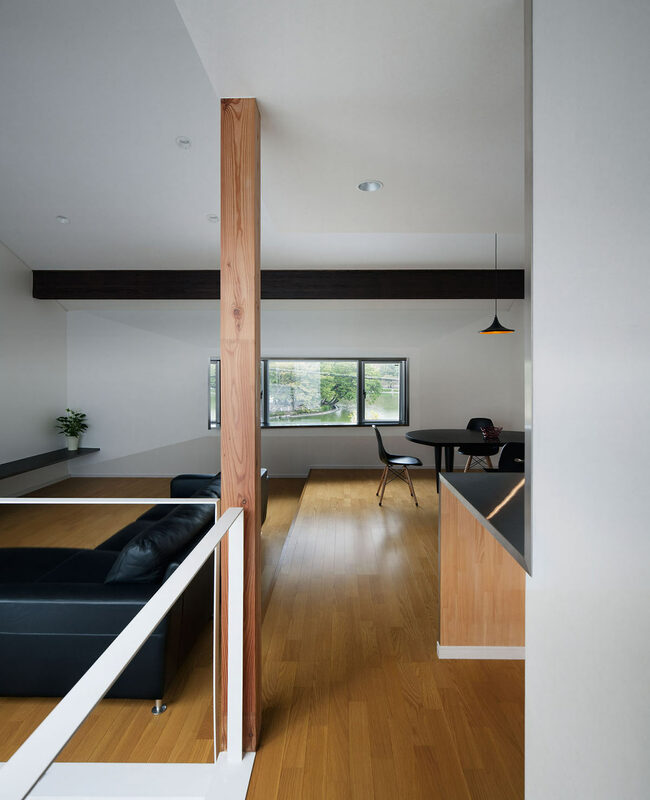 Using timber from a renewable source, coupled with building technology that utilised a hybrid of traditional mortise and tenon joint system with steel bracketing, this house was able to push the ubiquitous “boxed” building envelope for timber residential construction in Japan. 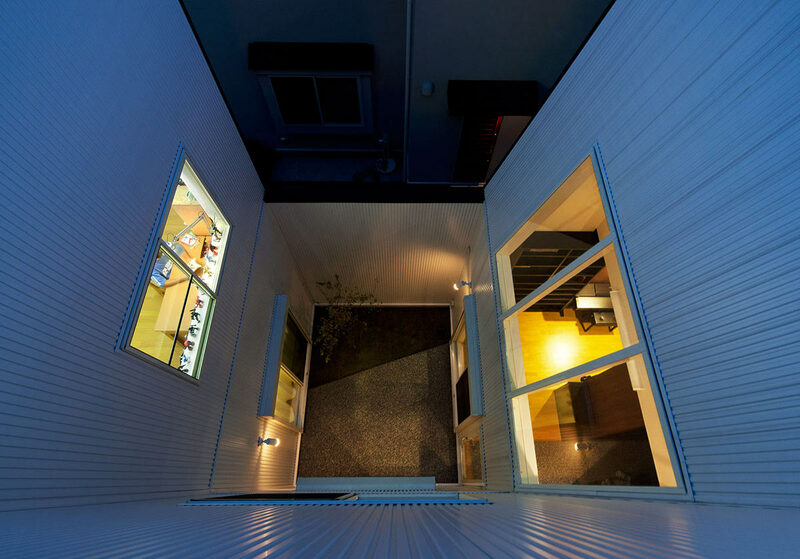 The solution to push the Public program to the upper level was obvious with the need to accommodate parking for 3 cars. 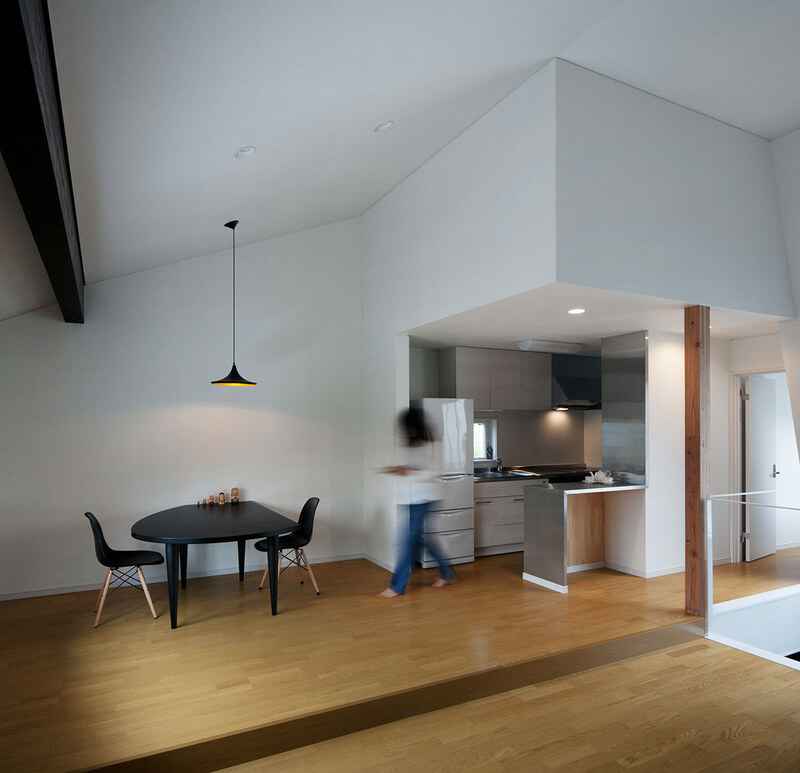 In addition, this offered an elevated scenic view of the park by having living/dining/kitchen at the second level. 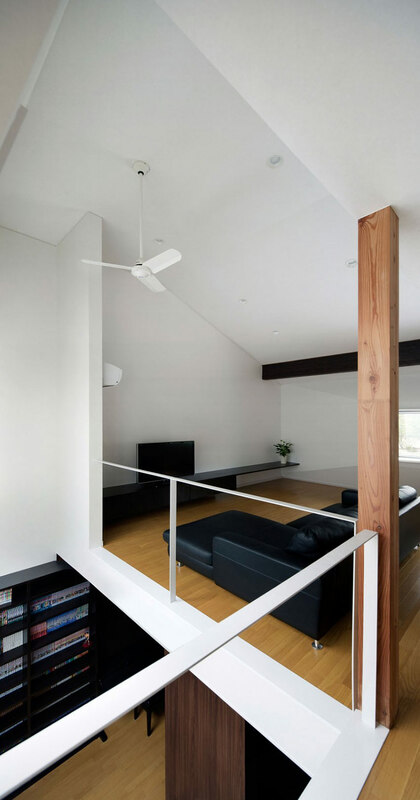 The extensive 3.2 m wooden cantilever was unusual with the norm capped at 1.5 m. The initial structural concept of using a truss floor progressed to the final structural solution; using an elegant inspiration from bridge construction and book shelf bracketing. 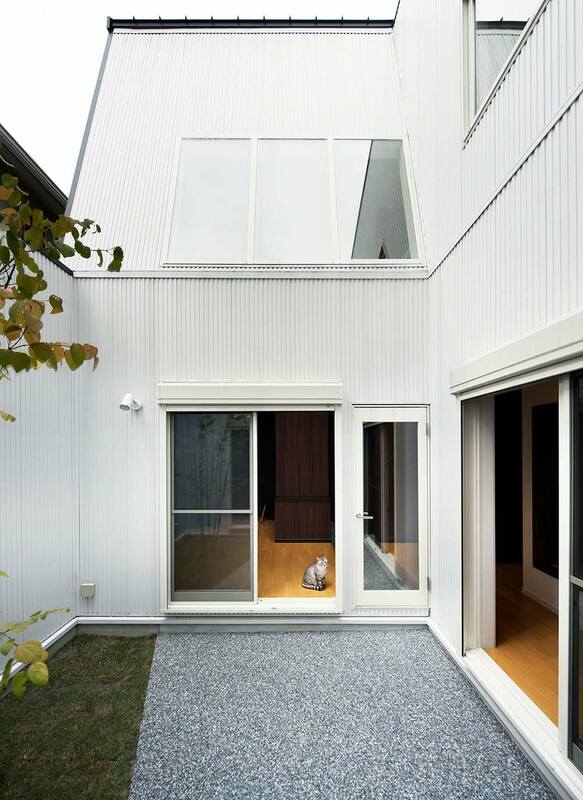 Further reinforcement of the structure was made in the courtyard wall to reduce eccentricity of built form and thus lateral movements during earthquakes. 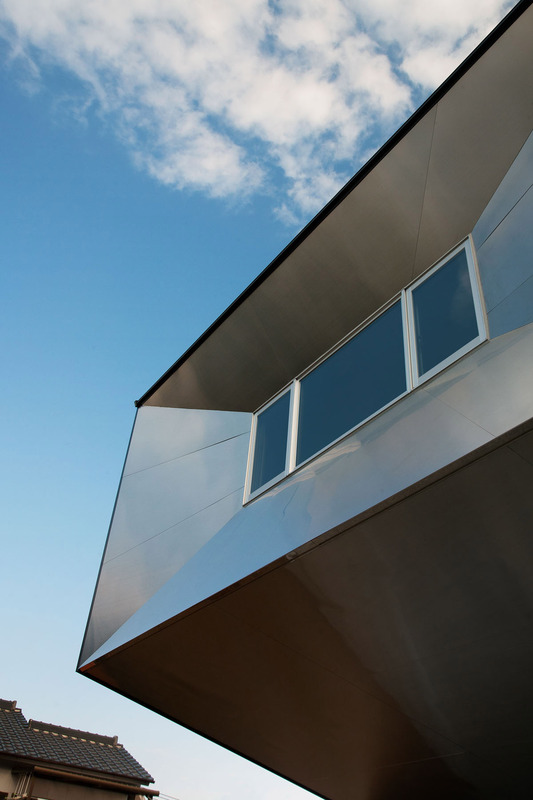 The outer form reflected the inner structure of the building, creating opportunities for expression of inclined surfaces. 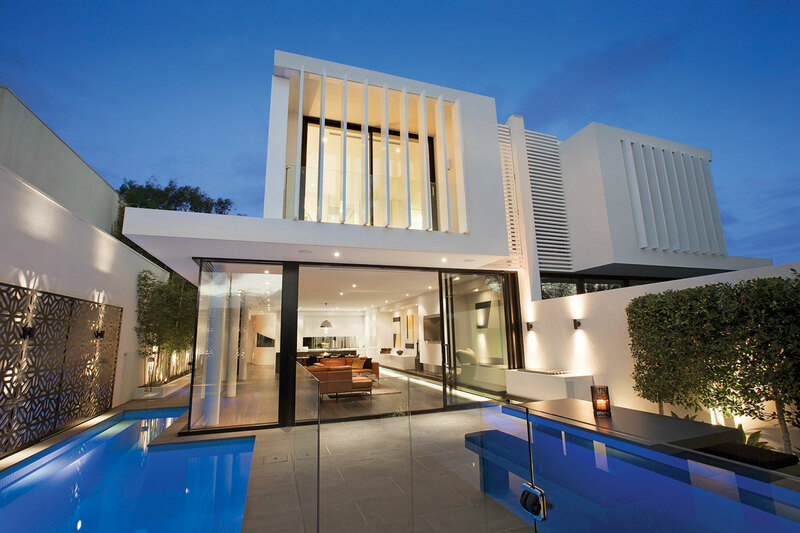 These further expressed their responses to rainwater drainage and the sublime reflection of the surrounding landscape. 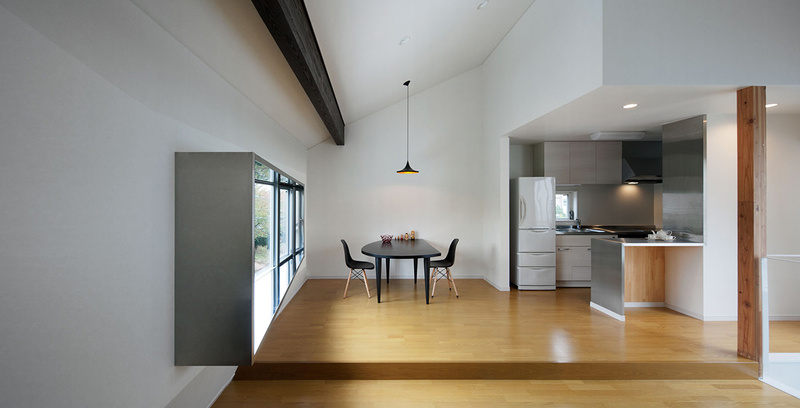 In order to bring views of the exterior Sakura into the dining space, an asymmetrical window ledge was purposefully built, providing a material continuity from exterior to interior and framing the picturesque view. 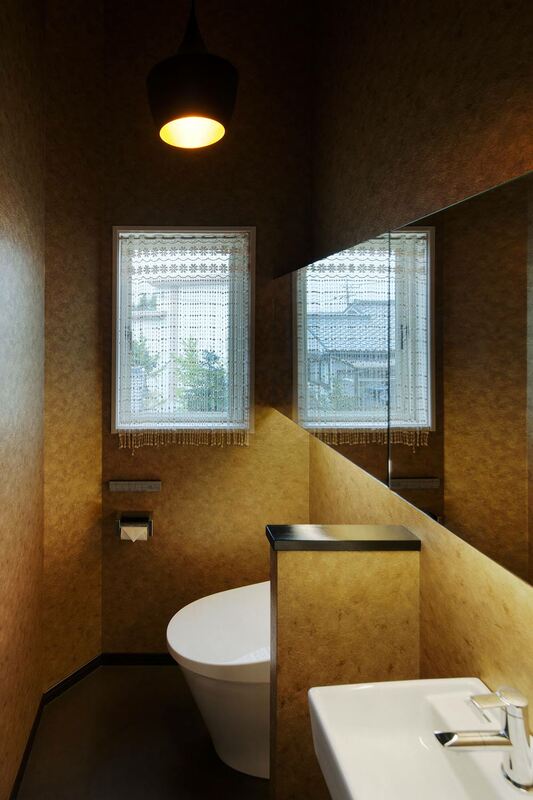 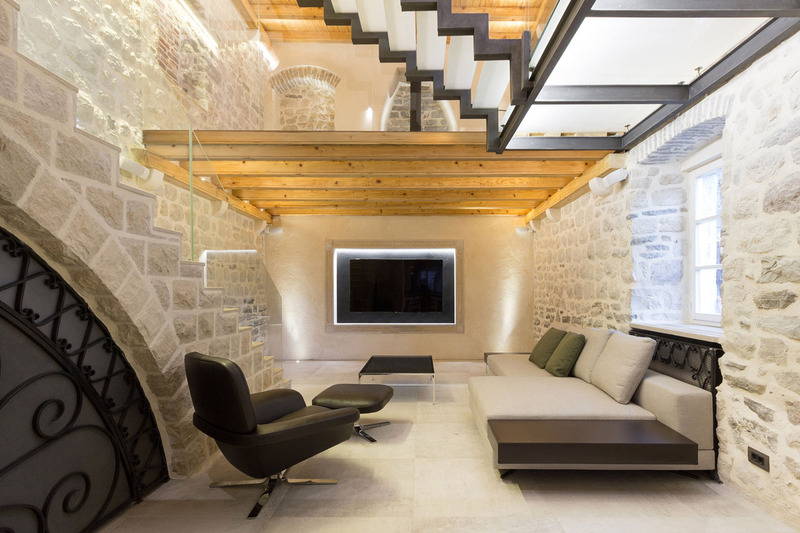 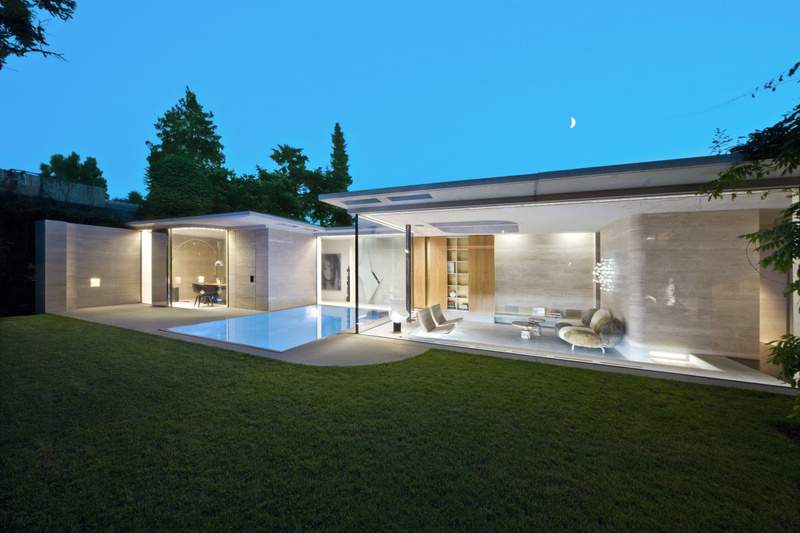 The idea of “Reflection” was multifarious and became a series of unfolded meanings; exterior reflection of surrounding, interior reflection of surroundings, introspective reflection spaces and reflection of the house structure. 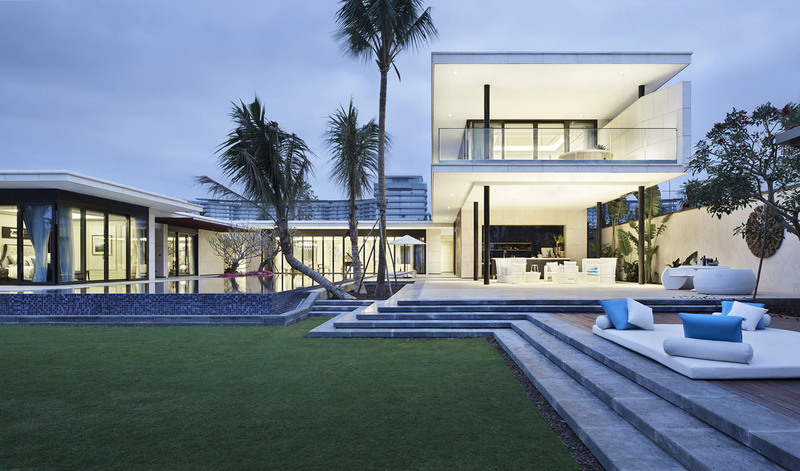 The landscape falls into three areas, the front yard, the courtyard and the roof deck. 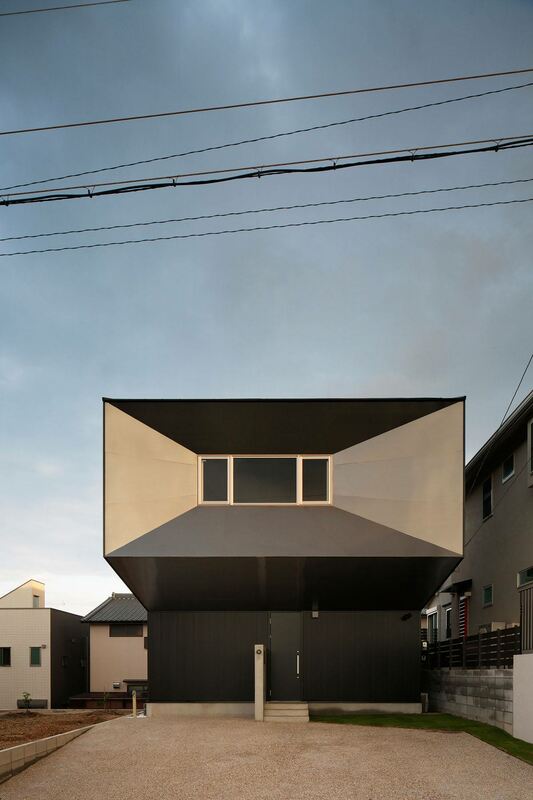 The front yard accommodates parking for three cars and becomes the entrance frame for the house. 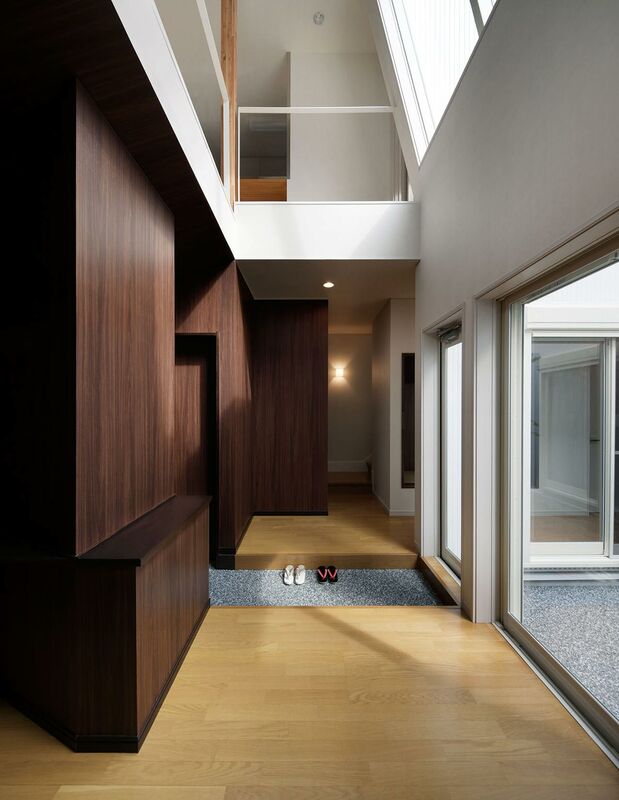 The connecting tissue to the park relies on the structurally evolved facade that visually associates with it and uses similar ground paving material. 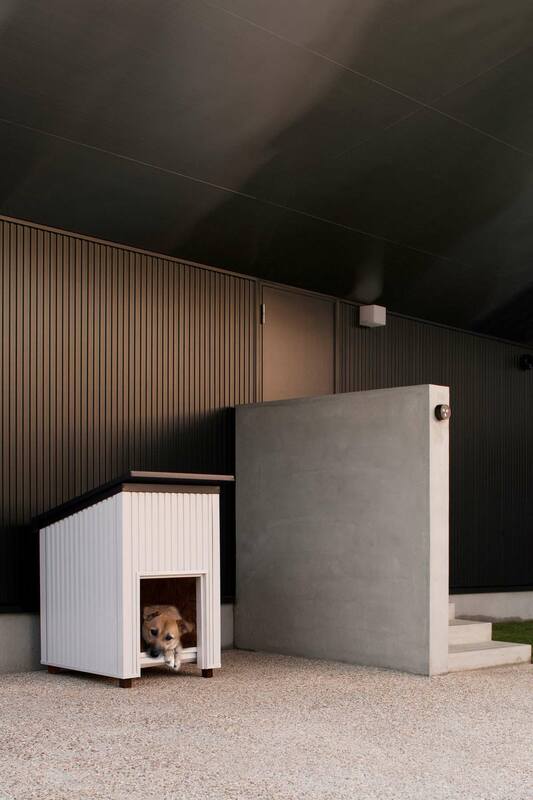 The courtyard, an intimate private garden forms part of the environmental funnel to dissipate hot air during summer. 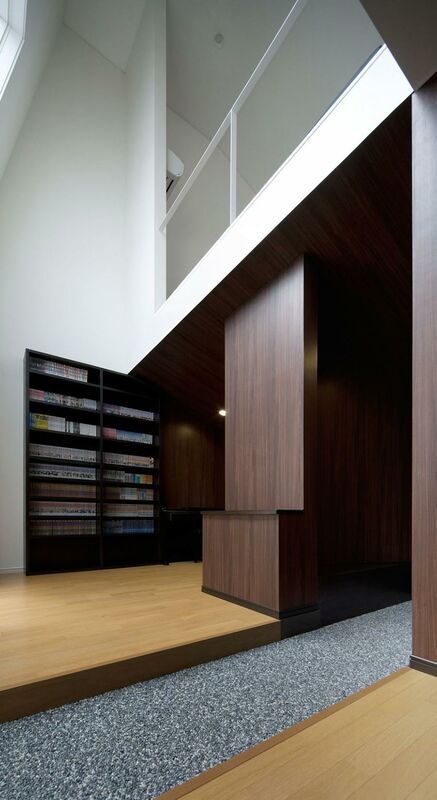 This space further anchors the master bedroom, 1-tatami introspective room, and double volume library. 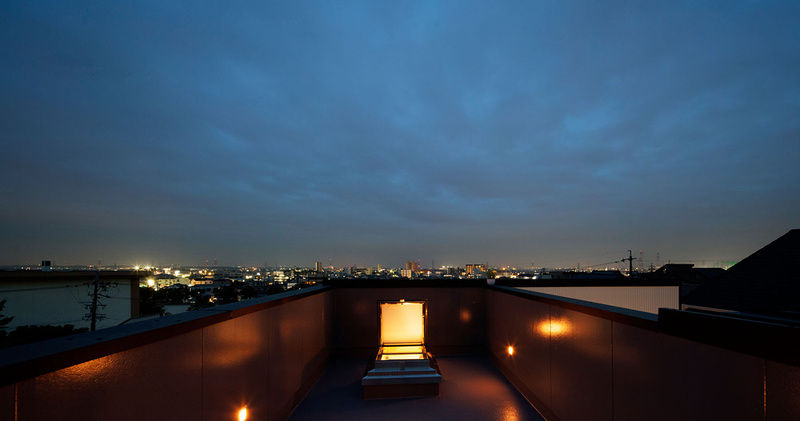 The roof deck, the pinnacle of the house further heighten one’s sense of place with its surroundings and provides the perfect viewing platform for both Hanami (Sakura) and Hanabi (Fireworks) festivals.